Does anyone know any good ways to passively learn Japanese? I do actively practice Japanese but I am looking for more ways to practice. Preferably anything I can listen to or do while driving. If anyone can recommend any good resources or strategies I would appreciate it. These are some of the things I’ve been looking into. I loooooooooooooove JapanesePod101 I don’t know why I haven’t been using it sooner! You need a subscription, but there are some free lessons you can check out & they give you a free trial to show you what premium is like (I believe it’s a 7-day trial). Thanks A lot @MissMisc. How do you listen to this in the car? Do they have an app or do you go to the website and listen through your phone? Once you register on japanesepod101.com, you just login with the same account info on the app, and voilà, you have an entire library of hundreds of podcasts that range from newbie all the way to advanced. You can even download the podcasts for offline listening, so you don’t even need internet/good internet to listen the podcasts in the app even come with transcripts, vocab lists, kanji closeups, etc. It’s really neat and is honestly so worth it. It’s really helped with my listening comprehension & they break the lessons down nicely so you can start to hear/practice the vocab you learn through WK with actual conversation (I often repeat words/phrases along with them to improve my pronunciation as well). I second JPod101. I think some of the podcasts are of questionable quality but the Nihongo Dojo series with Naomi is excellent. I looked for their app but for some strange reason I looked for “Japanesepod101” Why would anyone do that? I’ll get right to it! Watching TV works well, especially Japanese soap operas, as they talk very slowly in natural speech with dramatic pauses. I haven’t watched any for years, but a quick internet search revealed a bunch of links to popular series from the late 1990s. The advantage of the older ones is you’ll likely find them for free on YouTube. Here’s one listing that looked good. http://www.screenjunkies.com/movies/movie-lists/5-best-japanese-soap-operas Also, TedTalks are great, as they discuss serious topics and often have the option for subtitles in Japanese or English. I think the best ways would be anything that actually teaches you Grammar; jPod101, for example. Some people are using Japanese Ammo with Misa. Japanese From Zero might be another good series. I feel conjugatin い- and なー adjectives is easier now thanks to just watching her video on it. I work and go to school. So I’m all about having passive Japanese learning while I’m at work! 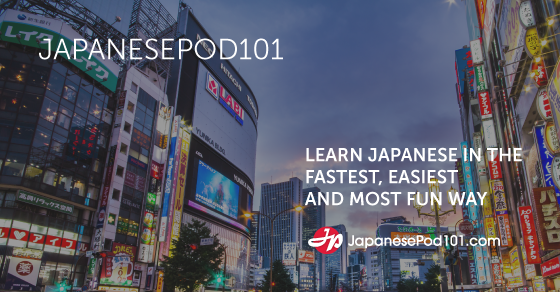 I just started JapanesePod101, and despite the relentlessness they have in trying to get money from you, they have a WEALTH of resources. I was quite surprised! You can do what I did by doing the free premium trial and downloading everything you want/need from beginner to advanced (audio lessons, grammar pdfs, lesson transcripts, etc) before the trial ends. Like other people have mentioned, the beginner lessons aren’t as polished as the intermediate or advanced lessons, but it’s still worth checking out. Honestly this is probably the best passive learning resource available. NHK Easy Japanese is another podcast I love. There are 48 lessons that are 10 minutes each. Professionally produced. Great for covering all of beginner Japanese. Mango Languages is a language course that is offered through public libraries! If you have a library card, check if your library offers it. It’s meant for speaking and listening practice. Some people don’t like it because it’s extremely repetitive and simple, but that’s kind of the point. It helps with practicing pronunciation and intonation and sentence building. I like to use it while driving. There are 20 chapters that cover beginner Japanese and maybe some intermediate? And they also have an actual Japanese film that you can watch and interact with to tie everything together. You can watch scene by scene and have the dialogue broken down with color coded kanji/kana/romaji/english, as well as grammar and culture notes. Also, weird fun fact: the English narrator for the course is the original voice actress of Ash from Pokemon! Another resource that requires a little bit more active learning is Human Japanese. It is an app you can download for PC, iOS, or Android. If you have time to passively read, this is for you. Human Japanese provides grammar explanations that make concepts you might have been confused about easy to understand. The tone is warm and casual, which makes learning feel more natural and less intimidating. I honestly owe it to this app for helping me understand many concepts in a different (and better!) way. There is Human Japanese and Human Japanese Intermediate. You can’t start in the middle of either, so you have to decide what your level is and pick one to start with. You DO have to pay. PC is more expensive. I recommend just getting it for your phone. They’re $9.99 each. Well worth it though. Satori Reader. By the same person who made Human Japanese, Satori Reader provides listening and reading practice. There are articles for all levels that cover a variety of topics (fictional stories, news, real life situations, etc). You can adjust the settings to show your preference of kana/kanji/furigana. You can even input your WaniKani API so that it only shows kanji that you know based on your WK progress! Sentences are interactive and will provide definitions and explanations of words/phrases if you hover over them. You control the pace of speech. There are even articles that cover what you learn in Human Japanese. It’s really wonderful. However, I feel like it’s more for intermediate and/or advanced learners. You might not get as much out of it if you are still learning beginner grammar. You can create a free account to try the first two chapters of each article they offer. HOWEVER, you do have to pay for a subscription, which is $89/year. Steep, I know. They offer a 10% discount (better than nothing). If you’re at the right level, Satori Reader is definitely worth the investment. And the creators deserve the support. Anything that has to do with reading and/or listening to the news. You’ll have to be at least intermediate level. NHK Easy Japanese News, News in Slow Japanese, and Hiragana Times are all good resources. You’ll have to pay for the last two, though. Benjiro has a YouTube channel where he uploads videos of his Skype lessons with italki Japanese tutors. Long format (~one hour each). He writes vocab and phrases so you can follow the conversation. His videos are for upper beginners to intermediate. Anyway, I’ve made this post long enough. I hope you find resources that you find helpful! Wow! This is exactly what I was looking for! I will be referring to this post for a long time. Thanks a lot! HATED THEM BUT SINCE I’VE MEET GENKI I LUV THEM!! THESE ARE THE GIFTS FROM YOUR 神 AND SAVIOR!! RESPECT THEM!! MA BOII! I THINK 酒 IS A GREAT MOTIVATOR WHILE LEARNING!! ALSO リポビタンD IS ALSO GUDDD!! The integration with WK is the best thing I’ve seen (as someone who learns Kanji only through WK). The way the integration works, Kanji that you have learnt will not have furigana above them as long as the word they are in only contains Kanji you know (unlocked on WK). NB: I am not affiliated with the developer or any parties with an interest in the products or company. It’s a valuable resource but there’s a lot a chaff to separate from the wheat. I also listened to a few episodes of JapanesePod101 and I really really wanna start downloading them to my phone and listening while I’m driving to/from school/work. As is already said by some in this thread and other reviews I’ve read, you kind of need to sift through the not-so-useful lessons and find the good ones. Regarding TV shows, I think I read a Tofugu recommendation about Terrace House which is on Netflix. I watched several episodes and it really is great for every day, conversational Japanese.